This page will briefly describe the additional enhancement to TRAKnet 3.0, integrated patient eligibility. Patient eligibility is offered through TriZetto Provider Solutions. For more information, please reach out to our sales team at moc.snoitulostenkart|selas#moc.snoitulostenkart|selas. Integrated patient eligibility is an additional enhancement with a per provider per month charge of $29. Integrated eligibility will allow the user to check a patient's insurance eligibility information directly from inside the TRAKnet 3.0 platform. Once purchased, activation is immediate within TRAKnet is immediate - you will only need to reconfigure your TRAKnet 3.0 database, as described on the installing TRAKnet page of this wiki. For your practice ID and code, please reach out to us at moc.snoitulostenkart|troppus#moc.snoitulostenkart|troppus. 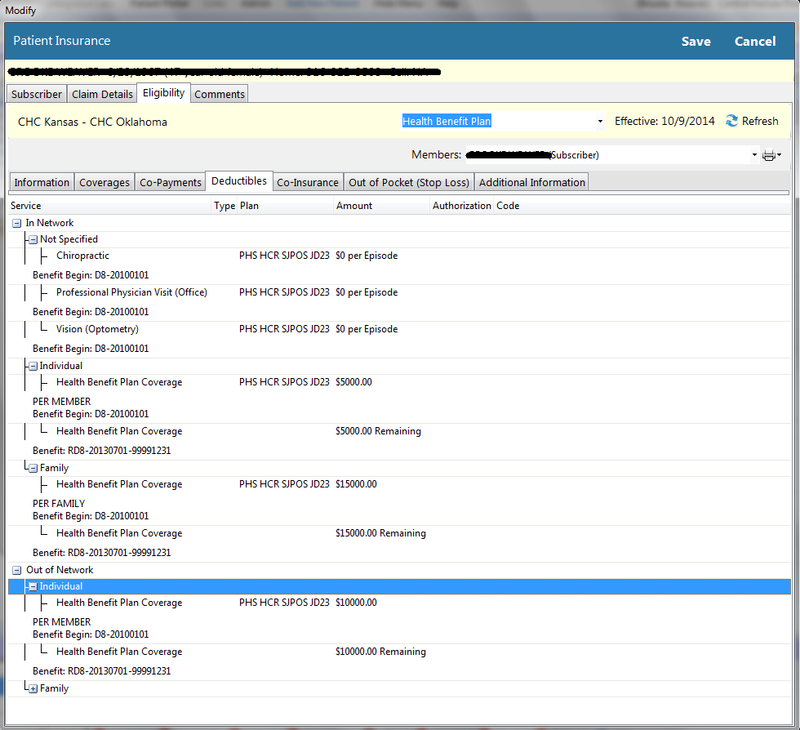 Scheduler > Selecting a patient's appointment > click on the Insurance link > clicking on the patient's insurance record. Patient's Chart > Billing tab > Insurance icon > clicking on the patient's insurance record. Encounter > Invoice tab > Insurance name. Once the insurance record has opened, click on the Eligibility tab to access the patient's eligibility information. This window is broken down further into several tabs, breaking down the patient's eligibility information. These tabs are displayed below, with a description of each image and what it is showing following each image. The first tab shows the patient's basic information. 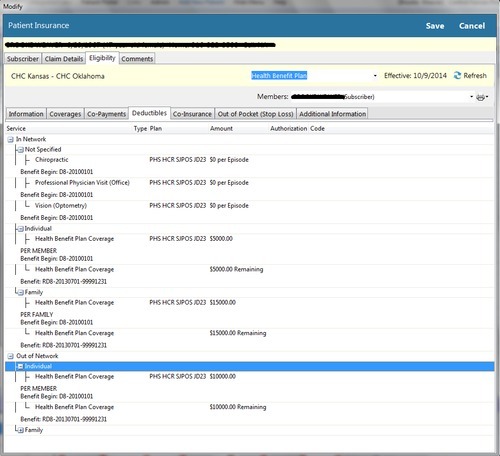 At the top of the screen is the insurance coverage name, the plan, and the effective date. 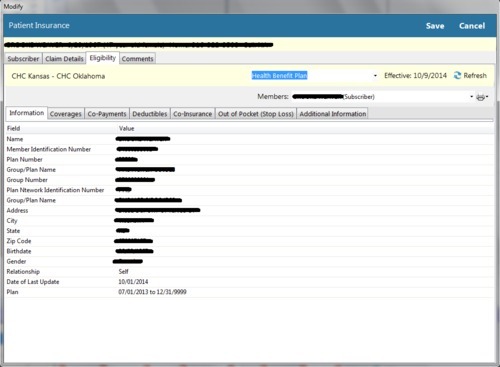 The second tab shows the patient's coverage information. 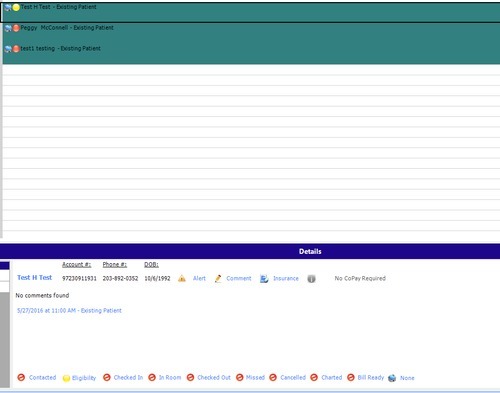 The third tab shows the patient's co-payment information. In this screenshot, we have highlighted the record for specialist. The forth tab show deductible information, both in network and out of network. The amount remaining is displayed. If applicable, DME deductible amount will be displayed. 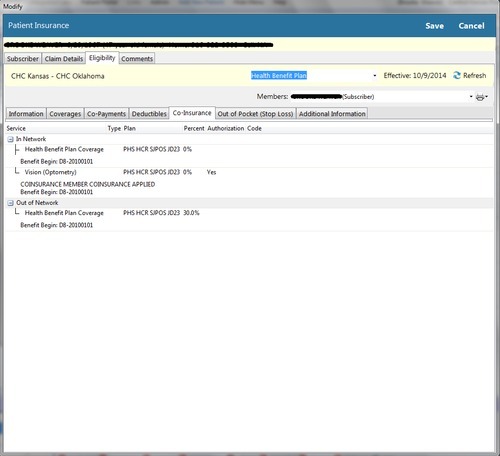 The fifth tab shows co-insurance information, both in network and out of network. 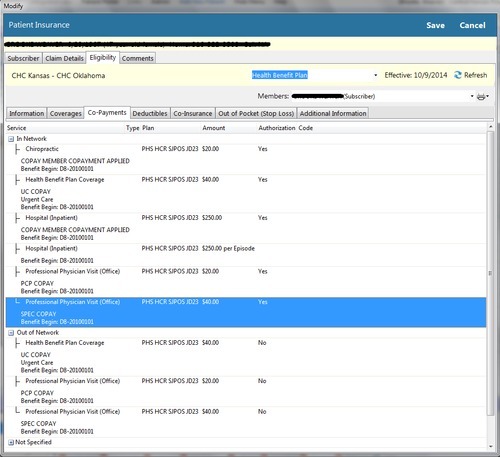 The sixth tab shows the Out of Pocket maximums for this patient's coverage, and the final, seventh tab shows any and all additional information. Please note that all information displayed is pulled from TriZetto and the insurance company. TRAKnet 3.0 will only display the information that is sent and cannot control what information is allowed per each insurance company. Eligibility can also be viewed at a glance from the day view of the scheduler. Each patient appointment will be displayed with a green, yellow or red icon. A green icon indicates that the patient has active coverage. A yellow icon indicates that the patient's coverage is unknown. A red icon indicates that the patient has no coverage or has no primary insurance. To set a default Batch Eligibility Provider, go to Tools, Options, Gateway EDI, and set a provider under Batch Eligibility Provider. To synchronize patient eligibility to the scheduler, press the Batch Eligibility button at the top of the scheduler. This will update eligibility for today's and tomorrow's appointments. Note that when you choose to synchronize patient eligibility, a large amount of appointments can potentially cause slowness in the system, so it is recommended this take place before or after hours or during a break in the day. To ensure that this button is not accidentally pressed during the day, you can remove the permission in User Permissions. To browse to a patient's eligibility from the scheduler, select their appointment and click the Eligibility icon at the bottom of the Appointment Details view, which will open the patient's primary insurance Eligibility tab.